A Turkish artist and journalist has been sentenced to two years and 10 months in prison for her painting showing the aftermath of the government’s assault on a Kurdish city last year. Authorities claim that Zehra Doğan endangered security by depicting an ongoing military operation in Nusaybin, but in fact her painting was based on a government photograph that showed the same scene. Doğan, an ethnic Kurd, is the editor of the all-woman feminist news agency Jinha. 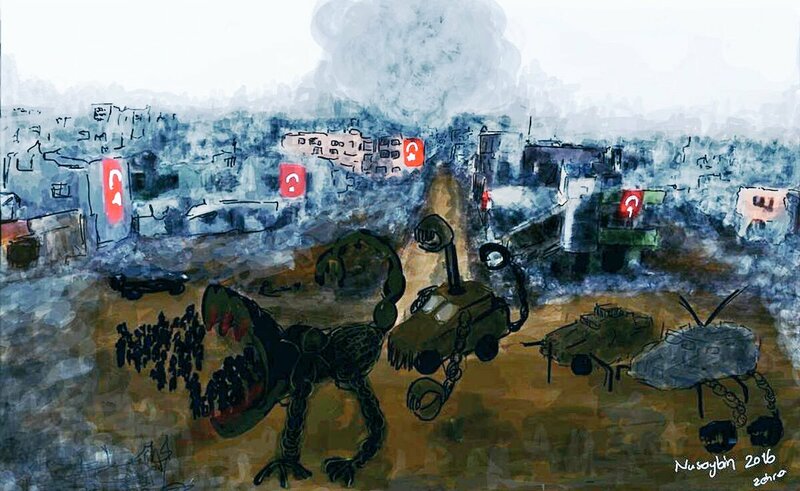 Last July as government forces attempted to quell the latest Kurdish uprising in the Nusaybin region, Doğan took inspiration from a photograph showing government tanks rolling through the city, with Turkish flags hanging from damaged and destroyed buildings in the background. The only substantial change in her painting based on the photo was that the tanks became spiderlike creatures; the flags and destruction were faithfully reproduced from reality. Nevertheless, Doğan was arrested and initially charged with belong to and producing propaganda for the banned Kurdistan Workers’ Party or PKK. Much like the cartoonist Musa Kart and his colleagues, Doğan was subsequently held without trial for several months. She was finally released in December before her trial began last month; the charges relating to the PKK were eventually dropped, but she was convicted on the very spurious charge of endangering security by depicting a military operation that was already depicted in an official government photo. While she was being held in pre-trial detention, Doğan and other female prisoners produced a prison newspaper inspired by the now-banned Özgür Gündem, which was shut down along with many other media outlets after the failed coup in July. The office of Doğan’s news agency Jinha also was forcibly closed in October, but the journalists continue to report through social media, according to IFEX.